That big old tree is dead center. I actually knew that when laying this painting out today. Most artists will say that is one of the cardinal sins of composition. But I think done correctly, you can break all the so called rules. Maybe not all at once. So, what do you think? Does it work centered? Or do I need to fire up the table saw? Here's one I did today. 5" x 7", oil on canvas panel, palette knife. Started it at lunch and finished this evening. 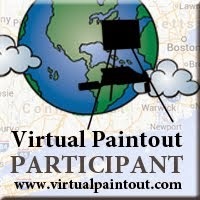 I did this one for my other blog, The Virtual Paintout, which uses Google Streetview to travel the world, one city at a time, finding interesting things to paint. It's open to everyone and every medium, except computer altered art. It runs from the beginning of a month to the end. So plenty of time to join in! I jumped the gun on this one. A couple of days early, but why not get April off to a running start? Comments are always welcome. Thanks for looking. Did this plein air piece today. Below you'll see it after the initial lay in of dark on my toned masonite board. Below that you can see my daughter working on, and then proudly showing off, her painting. Back to the State Series. This is #40. Again, all palette knife in Classic Artist Oils. I thought I would let this sit for a day or two, and think about what I wanted to accomplish with it, but I just couldn't. As you can see from the detail shots I got the palette knife out and think it helped (maybe). I'm getting happier with it at this point, but I'm not sure about the area below the stranded little dock. I have part of the dry land jutting out under the dock, but also have a slight shadow cast from the dock onto the water. To me this is confusing, as it could be seen as two shadows. This is one of the largest paintings I've attempted. Quite a change from all those tiny 5" x 7" knife paintings I've been doing for the last month and a half. This one measures 30" x 40", and is Classic Artist Oil on birch panel, and was painted with brushes for a change. I started it last night, worked on it a bit before going to work this morning, then at lunch, and finally this afternoon/evening. Not sure if it's finished to tell you the truth. Think I'll look at it for a couple of days. Any thoughts, comments or suggestions are more than welcome. Another in the Google Streetview State Series. This is number 39. Here's a quick plein air I did this afternoon. Man! It felt good to be outside painting again! Here's one I started at lunch today, and finished up this afternoon. I was asked if I'd show how I go about doing one of these small knife paintings, so I made a few pictures during the painting process. Please pardon the glare on the right side of most. Below you'll see my 5" x 7" canvas board toned a nice bright red. Next, you'll see my initial sketch done with raw umber and a palette knife. Here I've painted in the sky. In the next one, below, you'll see not much has changed other than adding a few hints of background foliage. The silo has made it's appearance. The buildings have now been painted. Next is adding some color to the tree and ground. Pretty simple really. Fire! No, not really. But it does appear the changing trees behind the house in this painting might be construed as flames leaping from the roof. But, I'm not going to change it. I don't know if many people are enjoying my little virtual adventure across the United States with this series, but I know I am. And one of the things that I think adds to the general likeability of these paintings is the spontaneity. I may be wrong, but I don't think I've gone back and worked on any of these after the initial painting session. So I don't think I'll start now. It's all about having fun, right? Did this one in the ongoing series tonight. Comments welcome. Adding to the State Series, this old house sits just off the road not far from the Forbus Store in Tennessee. Here's my latest. I'm including the sketch once more to show that I had planned on including a telephone pole in the right half of the painting. There's something about telephone poles that I like in my paintings. I think it might be the extreme vertical line. Not sure. You can see in the final result that I left the pole out though. What would you have done? Leave it? Take it out? I kind of like the composition as it stands. Thoughts? Above is the initial palette knife sketch, on toned canvas, of a view in Charleston, South Carolina. Not your normal big beautiful southern mansion. But somebody's mansion just the same. Below is the final painting. Measuring 5" x 7", oil on canvas, done totally with the palette knife. Comments are most welcome. Thanks for looking. Another in the Google Streetview State Series. This view was caught at Maumee Bay State Park just outside of Toledo, Ohio. Actually used only brushes on this one. Not part of the ongoing State Series, but instead done (with brushes for a change) for the Virtual Paintout blog project for March. If you haven't checked it out yet, make sure to do so. The more participating the better! Any medium is okay except for computer created/generated. Simply follow the link above or to the right in the sidebar.